The F-TYPE’s exquisite, perfectly-proportioned exterior is enhanced by the Exterior Black Design Pack, which benefits from SVO extended side sills to subtly increase the visual width and give the car even greater presence and poise. The 20-inch Gloss Black wheels with Diamond Turned finish are exclusive to the Chequered Flag and perfectly complement the red finish of the brake callipers. Power comes from the 300PS/400Nm 2.0-litre four-cylinder Ingenium petrol engine or the 340PS/450Nm and 380PS/ 460Nm supercharged 3.0-litre V6 petrol engines. 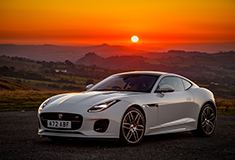 All engines are matched to eight-speed Quickshift transmissions and send drive to the rear wheels, or – in the 380PS models – the choice of Jaguar’s all-wheel-drive system with Intelligent Driveline Dynamics.